Nearly all my multi-day hiking has been with lesser-skilled youth. My goal with these trips is to keep them safe, teach them skills, and help them enjoy the adventure. That meant packing more equipment, food, and what-if items than would be needed if everything went perfectly. When hiking with other skilled and experienced hikers, less equipment is needed which means a lighter pack. The amount of gear and weight of pack basically determines the style of hiking your group will do. 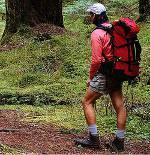 There are no absolute definitions of specific packing and hiking styles, but there are categories used to describe the general styles. 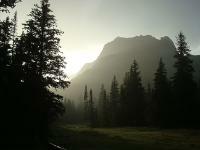 Backpacking - carrying all gear you'll need throughout a multi-day hike. Thru-hiking - backpacking an entire designated trail in one season, usually from one end to another, but there are alternate itineraries. Slackpacking - doing short hikes on portions of a long trail, carrying only the bare essentials rather than a full pack. Someone else may transport your pack by vehicle to the next trailhead for you, or pick you up and give you a place to stay the night. BPW - Base Pack Weight - everything in your pack except consumables (food, water, and fuel). Does not include what you are wearing. The consumable weight will change over the course of the trip. TPW - Total Pack Weight - BPW + consumables. TBW - Total Base Weight - BPW + everything you're wearing. Does not include consumables. SOW - Skin Out Weight - everything except your naked body weight. The Skin Out Weight is really the best way to figure how heavy your load is. If you wear layers of clothes so you can take a light sleeping bag, you still have to carry the weight, just on your body instead of in your pack. Many people spend way too much time shrinking their BPW so they can think of themselves as UltraLight hikers, but that's a waste of effort. The goal should be to reduce the entire amount you need to move up the trail (the TW) in order to have a more enjoyable hike, but still remain safe and as comfortable as your enjoyment requires. Include adequate first aid and weather protection. Carrying 25lb instead of 50lb is more comfortable all day. Lighter, stronger materials are more expensive - but check into making your own. Lightening your load doesn't need to be a revolutionary event. You can evolve your gear and acquire lighter items as needed. Always keep safety a Number One priority whenever heading outdoors and take the first aid and emergency items that really make sense. Shelter - tents, tarps, or bivys are all options for shelter depending on your preferences, insects, and expected weather. Sleep System - sufficient insulation from the ground and air to keep you warm all night is the requirement. 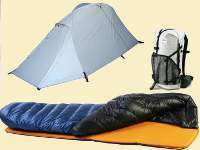 There are dozens of sleeping pads and sleeping bags from which to choose, using different insulation types and amounts resulting in different temperature ratings and comfort levels. Pack - the pack in which you carry everything weighs something itself. Some framed packs may weigh 7 or more pounds. An ultralight frameless pack can be under 1 pound. There are many choices in the sub-3 pound range. Working on getting your Big Three weight under 8 pounds (or lower) is a good starting goal, but don't get a lightweight pack before reducing the weight you will put in it. Lighter packs are intended to carry lighter loads.